Journey is the latest downloadable title from ThatGameCompany, the same guys and gals who brought us titles such as Flow and Flower. Now that their contract with Sony is officially up, could Journey be the last and best exclusive downloadable title for the PlayStation 3? Or was this specific journey not worth taking? The game begins with you controlling a hooded figure in the middle of a vast desert. There are no maps or instructions as to what you have to do other than the need to head towards a shining mountain top that’s viewable throughout the entire game. The main goal is there and at the end… well that would count as a spoiler. Oooh shiny! Let's go there!! At the start you can only walk around but as you go along you will find objects that will create a sort of scarf running along the back of your character. The scarf can be lengthened through finding glowing orbs and it enables you to fly by coming into contact with cloth that you’ll find along your journey. This cloth can range from small rectangular pieces to giant banner like versions but what’s interesting is the way they act so life like, flowing through the air and in and out of the sand. Some of these cloth have to be woken up and that can be done with a small note or shout from the player which brings them back to life. This shout also helps while flying enabling you to use the cloth in the air to regenerate your flying time. Along the way you will encounter decent puzzles that require little effort to complete but instead they serve the purpose of keeping the player in that environment for an extended amount of time in order for them to fully take in their surroundings. Later down the line you also encounter simple AI enemies which require a sort of stealth movement. There is a Co-Op element to the title but something that’s very simple and only works when connected online. Throughout your playthrough, random players will be dropped into your game in which you can both journey together. There is no way to contact the other person other than the shout and you can’t view their name until the end however it’s amazing how useful it is, doing just as much as text or voice chat could. 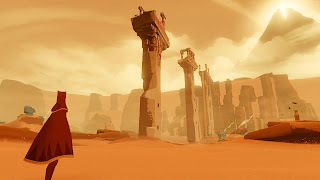 The whole aim of the game looks to have the player become immersed with the environment, whether your traversing a huge desert or sliding down sand dunes during sunset, the entire emphasis seems to be on the environment and less on controls. Visually, Journey is a masterpiece having created some amazing landscapes and environments using bold and sharp colours. It gives off a unique look that both pleases the eye and is artistically impressive. The style is simple however since there were no weird loading times and graphical glitches, it worked out much better this way. Sound work just adds to the overall feel and atmosphere making use of some cleverly mixed compositions for the areas that require it. It works hand in hand with the environment to create some truly spectacular moments. Journey is definitely one of those titles that look outside the box when it comes to functionality in its design. The use of no instructions or maps allows the player to get a feeling of freedom and free exploration. In a way it purposely gives you the whole screen with no obstructions to allow the player to take everything they see in and fully immerse themselves into the game. While this is definitely an interesting move, it works well for the game but at the same time it may not be everyone’s cup of tea, especially those who are used to having some sort of feedback e.g. Health bar or points. 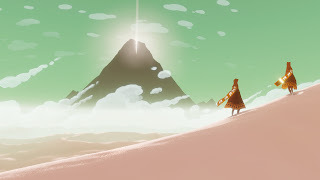 ThatGameCompany have created yet another title that makes us gamers think about our games in a completely different way. While the overall journey is a short one, it’s the time taken to see the environments and world that make it all worthwhile. Journey will take you on a complete emotional rollercoaster through its brilliant sound work and amazing world, that’s sure to make you see videogames in a whole new perspective.